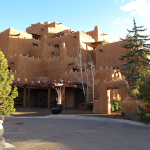 If you’re looking for a nice hotel within walking distance of just about everything in downtown Santa Fe, the Inn at Loretto is an excellent choice. An AAA 4-Diamond property, as well as having been on Travel & Leisures Top 100 hotel list, the Inn at Loretto lives up to expectations. 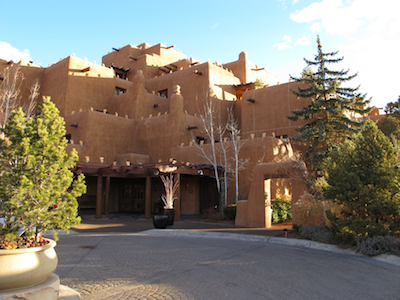 Location: The Inn at Loretto is just two blocks off of the main plaza in Santa Fe. You’re less than 5 minutes away from shops, restaurants, and most of the historical sights downtown. If you’re arriving by car from I-25, it takes about 15-20 minutes to get to the hotel. From Albuquerque, it’s a bit over an hour to the northwest. Rooms: Rooms here are very good sized, especially if you go with the Deluxe rooms. Most of those have sitting areas and some with balconies. 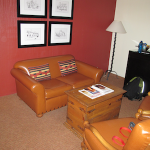 Beds are extremely comfortable and the rooms are well appointed. Bathrooms are just a touch on the small side, but still adequate. One thing that is nice here is that rooms are very quiet. Due to the thick adobe-style walls, you’ll barely hear a peep from anywhere. Some rooms on the first level have small outdoor patios facing the parking lot. There are only one or two elevator banks in this hotel, so some rooms can be rather far away for some guests. 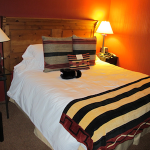 The Inn is pet-friendly and charges $25 per stay per pet, up to two. Facilities: The hotel has a pool, exercise room and full-service spa. There’s a huge bar area just off the main lobby and the on-site restaurant is Lumenaria. We were only able to have breakfast at Lumenaria, but if their breakfast was any indication of what lunch or dinner is like, it’s phenomenal. Parking is via valet. The entire hotel and parking area is enclosed by a wall around the perimeter. Staff: Staff was great from the valet and check-in to the restaurant. Pros: Best location in town, ultra quiet rooms and great restaurant. Occasionally the hotel has special rates on Jetsetter.